It's pretty safe to say that when it comes to doing things 'logically' over the years, the New Orleans Saints franchise hasn't always "followed the script". Throughout the team's 50-plus year history, there's been a handful of different occasions where the organization left fans and the assorted media that covers the team, scratching their heads in jaw-dropping amazement. Like the time that they drafted a kicker with their top pick in the 1979 NFL Draft. The kicker -- University of Texas All-American Russell Erxleben -- went on to become one of the most notoriously vilified players in Saints draft history. For people my age or older, Erxleben remains an unforgettable enigma in an entire series of NFL Draft missteps over an extended period of time for the franchise. Which is why those same older Saints fans (along with the younger ones as well) have been able to breathe a sigh of relief in the past 2 seasons while New Orleans has been led by the steady guidance of Director of College Scouting Jeff Ireland. Back during 2015 -- Ireland's first year with the team -- the Saints made a total of 9 selections in the 2015 NFL Draft, which was the most players the Saints had taken since 2002; when that year they also took nine. Among the picks, the Saints landed 3 rookies who became starters: top pick and offensive tackle (and now current starting left guard) Andrus Peat, middle linebacker Stehphone Anthony, and defensive end / outside linebacker Hau'oli Kikaha. 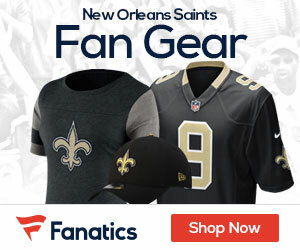 Then last year in the 2016 NFL Draft, New Orleans made just five picks but still ended up with 3 more rookies who became eventual starters: top pick and defensive tackle Sheldon Rankins, wide receiver Michael Thomas (who has quickly developed into the team's #1 WR), and free safety Vonn Bell. Ireland has brought a calm and steady hand to the Saints' draft process, but more importantly: he's given it a sense of logic. The Saints are now making picks in the NFL Draft that make sense, and not ones that leave us scratching our heads. But another thing stood out last year specifically with regard to his selection of top pick Sheldon Rankins out of the Unoversity of Louisville at #12 overall: it was what many analysts at the time considered "the safe pick". In other words, the Saints took the one player on the board at that time, who most likely was capable of filling their BIGGEST need at that moment. True to form, Rankins delivered on his potential, and appears poised to be an All-Pro caliber defensive tackle at the NFL level, for many years to come. Which takes us now to this year's upcoming 2017 NFL Draft of course, which as of this very minute is only 2 and a half weeks (17 days, to be exact) away. The Saints have 5 out of the first 103 picks in this year's Draft, including their top pick at #11 overall. And with a variety of team 'needs' still yet to fill, the Saints have an interesting array of possible scenarios of how to utilize that pick; which include edge rusher / defensive end, linebacker, cornerback, free safety, running back, and arguably even another quarterback --- depending upon your view of just how far you actually (and honestly) think current 38-year old QB Drew Brees can play into his early 40's. But if we are to assume that just like last year Jeff Ireland will once again allow logic to dictate which direction the Saints will eventually go in with that top pick of theirs at #11, then you'd have to think that it would be at edge rusher / defensive end; which near-unanimously is considered to be the position on the team that is its BIGGEST 'need'. The top-rated edge rusher / DE in this year's Draft is Texas A&M All-American Myles Garrett, the consensus #1 player in the entire Draft class and the expected #1 overall pick by the Cleveland Browns. After Garrett, the next best and #2 rated edge rusher / DE is Solomon Thomas of Stanford; who a majority of Draft analysts believe will go right behind Garrett to the San Francisco 49ers at #2 overall. From there, it's anyone's guess to just what the teams picking before the Saints make their pick at #11, will do with their own selections until it actually happens. But if (and that's a mighty big "if", given the unpredictability of the Draft board every year) things turn out the way that analysts believe they will, then the top player that might still be on the board when the Saints pick at #11 is a player whose name is one that most fans are at least vaguely familiar with, given the numerous amount of times already that he's been picked in "Mock Drafts" to be the Saints pick: Derek Barnett of Tennessee. Barnett is one of the most feared pass rushers of this class, and the 6-foot-3 inch, 259 pounder had 10 or more sacks in each of his 3 seasons in Knoxville (the only player in the SEC player to do so). He also managed to break NFL Hall of Fame legend Reggie White’s school records for sacks (33), and finished second in school history with 52 tackles for loss. Additionally, he also added an impressive tally of 31 QB pressures in his career. Our good friend here at the Saints News Network, the one and only Mike Detillier; who most (if not all) Saints fans know is the renowned and well-respected NFL and college football analyst with WWL New Orleans TV and Radio and appears nationally every day on a variety of syndicated radio and television programs such as ESPN, says this about Barnett (whom he rates as the #3 overall available defensive end in the class, behind Garrett and Thomas) in his just-recently published 2017 Draft Report, available right now. Note: to order a copy of Mike's brand new 2017 Draft Report available now for only $23.00 (trust me when I tell you, it's an unbelievable bargain considering the wealth of outstanding analysis and information coming from one of if not THE most respected NFL Draft experts of the past 30 years), you can go to either saintsreport.com or click right HERE. "Very productive college defensive end who plays 'all-out' on each and every snap. Derek is well-built in the upper-body and he holds his own with very good lower-body power when running plays are directed at him. Very flexible athlete who gets off the snap quickly and he can 'quick-bend' his way into the backfield. Barnett is quick off the snap and he has 1st rate anticipation skills to what is breaking down in front of him. He plays the game on balance and uses good pad level to defeat his man. He has very strong hands and hits them with force on an opponent to get by. Anticipates the snap very well and he just flies by opposing blockers. Plays with both speed and power to defeat his opponent. Fine technician. Derek gets his hands up in the air quickly and he is disruptive to throw over. He has very good closing speed to the quarterback and great hustle to chase down plays from the backside. Derek needs work on developing a fuller array of moves and counter-moves to defeat his opponent. Has good but not great foot speed and quickness when turning the corner. Very aggressive football player and while I love to see this out on the field, it also leads him to over-run plays miss openfield tackles. He does a good job anticipating the snap-count, but he will also jump offsides at times when he misfires. Many will question his top-level athleticism, but he is a good athlete who is a playmaker on defense and NFL teams will really like his hustle , smarts, and energy out on the field. I am big on effort and you get that in a 'bucketful' with Barnett"
Mike goes on to compare Barnett to former 5-time NFL Pro Bowl defensive end Justin Smith of the Cincinatti Bengals and the San Francisco 49ers, and notes that Barnett could turn out to be just as Smith did, to not be the biggest, strongest or fasted defensive end in the League, but will still be able to perform at a high level due to his very good athletic skills, toughness, smarts, and all-out play. Barnett isn't an "elite" athlete as Garrett or Thomas are, which is why he could fall out of the Top 10. But his mental aptitude and on-field awareness make up for his noted lack of athleticism; and his relentless drive and passion for playing the sport of football is what clearly motivates his aggressive effort to make big plays in the most crucial of moments. Interestingly enough, Barnett is a player that has been "mocked" to the Saints in a handful of published Mock Drafts by a wide variety of different analysts --- although he isn't the overwhelming favorite. A large portion of Saints fans themselves are strongly in favor of the team taking Barnett if he's available, though there are a handful of other players -- most notably Alabama middle linebacker Reuben Foster, Michigan edge rusher Taco Charlton or Temple linebacker / defensive end "hybrid" Haason Reddick (whom I projected to the Saints at #11 in my own Mock Draft recently) -- who have all emerged in recent Mocks by prominent analysts from across the country, as the possible player that could end up in New Orleans. Even Stanford running back Christian McCaffrey has garnered support from a sizable portion of Saints fans who would instead like to see the team take the dynamic offensive 'weapon' with the first pick, and then subsequently take defense afterwards in what's being called the "deepest" NFL Draft class on the defensive side of the football, in many many years. Of course, whoever the Saints end up taking will ultimately be determined by what the other 10 teams picking ahead of the Saints, decide to take with their picks. A trade here or a last-minute deal behind-the-scenes there could potentially "shake up" the entire Draft itself, all just because of one unexpected move at the top of the Draft order. But regardless of how it actually turns out, Saints fans can at least breathe a sigh of relief in the knowledge that this Saints team's draft process -- very much unlike it was all of those years long ago -- is finally in good hands. In two and a half more weeks from now, we'll see if logic once again dictates that the organization and team management, makes "the safe pick".